Presents 33 easy to moderately-difficult arrangements of works by Bach, Beethoven, Bellini, Carulli, Czerny, Giuliani, Haydn, Leopold and Wolfgang Mozart, Mussorgsky, Purcell, Schubert, Vivaldi, and others. Thoroughly researched, all of the arrangements are faithful to the original compositions while remaining very readable. Selections include "The Old Castle" from "Pictures at an Exhibition" (Mussorgsky), "Largo" from "The Four Seasons" by Vivaldi, "Casta Diva” from the opera "Norma" by Bellini, and many more. Flute and guitar duos of any level will find this book both useful and beautiful--a great "gig" book. The guitar part is written in standard notation only. 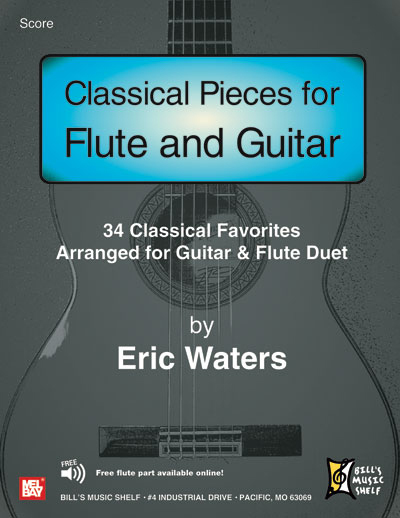 A free solo flute part download is available for use with this title.